On Sunday, September 21, 2014, hundreds will gather at the U.N. Chapel to witness the New York premiere of Sliver of a Full Moon, including Ambassadors, members of the U.N. Permanent Forum on Indigenous Peoples, White House staff, media, policy analysts, foundations, and non-profits from all over the world. The event will be recorded and streamed live on HowlRound.com. The Center is co-presenting Sliver of a Full Moon, the story of a movement to restore safety and access to justice to American Indian and Alaska Native women in the United States. It documents the grassroots movement leading up to the historic 2013 re-authorization of the Violence Against Women Act (“VAWA 2013”)—an affirmative step forward by the United States towards restoring safety to Native women and sovereignty to Indian tribes to address certain violent crimes by non-Indians on Native lands. Sliver of a Full Moon is specifically being staged alongside the World Conference on Indigenous Peoples taking place Sept. 22-23. Millions of indigenous women worldwide suffer disproportionately high and multiple forms of discrimination and violence not only because they are women, but also because they are members of indigenous communities. The majority of the perpetrators of violence against Native women are non-native, yet, for over three decades discriminatory United States law stripped all Indian nations of their inherent authority to protect their own women, children, and communities from such violence. In 1978, the Supreme Court declared that American Indian Nations could no longer exercise jurisdiction over non-natives who commit crimes on tribal lands. (Oliphant v. Suquamish, 435 U.S. 191). 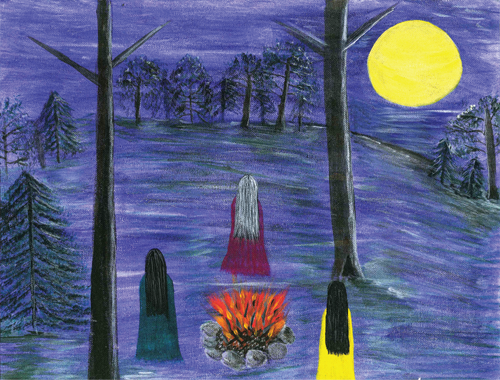 Sliver of a Full Moon’s cast features three courageous Native women who stepped forward to publicly share their stories of abuse by non-Indians and counter staunch opponents to the tribal provisions—Diane Millich (Southern Ute), Lisa Brunner (White Earth Ojibwe), and Billie Jo Rich (Eastern Band Cherokee). Professional actors will join them to portray Congressman Tom Cole, Eastern Band Cherokee Councilwoman Terri Henry, and Tulalip Tribe’s Vice-Chairwoman Deborah Parker. And, for the first time ever, Sliver of a Full Moon will feature the stories of women survivors and advocates from Alaska, including Lenora (Lynn) Hootch, Joann Horn, Priscilla Kameroff, Nettie Warbelow, and Tami Jerue. For more information, visit www.sliverofafullmoon.org. To participate online use #SliverofaFullMoon. Tickets for the evening performance are available for purchase from Joe’s Pub. The Indian Law Resource Center is a nonproﬁt legal and advocacy organization that provides assistance without charge to help indigenous peoples throughout the Americas protect their lands, resources, human rights, environment, and cultural heritage. Its principal goal is the preservation and well-being of Indian and other Native nations and tribes. The Center’s Safe Women, Strong Nations project works to end the epidemic levels of violence against Indian and Alaska Native women in the United States by raising awareness of this issue nationally and internationally, by strengthening Indian nations in restoring safety to Native women, and by assisting national Native women's organizations and Indian nations on restoring tribal criminal authority. For more information, visit www.indianlaw.org. Gray Panthers at the United Nations has been extremely active advocating for social justice and peace throughout the world. Gray Panthers holds official nongovernmental organization (NGO) status at the United Nations and represent “Civil Society”—the real people. The work that our delegation does at the UN plays such an integral and significant role in expanding advocacy efforts on a global scale.